In Taiga, you can manage the settings of the current project, if you have the appropriate access level, from the ADMIN module. To access the ADMIN module, on the Taiga Panel, click . To view which settings you can manage in one of the sections of the ADMIN module, click the name of that section – this action displays a list with the groups of settings that you can manage, on the right side of the list that shows main sections ADMIN module. 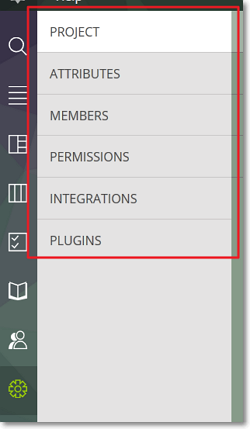 Note: If a section of the ADMIN module does not have multiple groups of settings, when you go to that section, you will directly access the page that shows the settings that you can manage.